Orrville and Clear Fork are set to meet for the 2nd time in 3 weeks, and for the 3rd time in the playoffs. 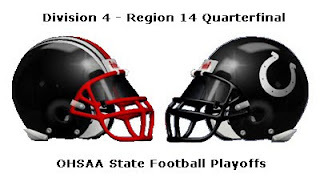 Orrville has never met a regular season opponent (and conference opponent) in the playoffs (in the same season) and will seek the always tough "beating a team 2 times in one season" task. I'm guessing this is also the first time that two OCC schools have met in the playoffs. Both teams come off week 10 wins, and both teams come in a little banged up. Both starting tailbacks are injured, but Orrville's Tre Simpson is expected to play, while Clear Fork standout Jordan McCune is out for the season. Orrville will look to again etablish the run, whether is be Simpson (who needs 44 yds to get 1,000 for the season), or sophomore Mason Monheim, or seniors Dillon Corbett or Thirajn Pittman....if nothing else, the Riders have options, including QB Joe Besancon (506 rush yds). Monheim saw his first action at running back in over a month in the 4th quarter of the Wooster game, and delivered some key runs in sealing a 15-7 victory. As for Clear Fork's approach in this game, don't be surprised to see them spread it out and go for broke. Even without McCune, the Colts have dangerous weapons in QB Travis Hissong, back Eric Kline and WR's Jake Dickerson & (Neon) Dion Bellamy. If they're able to hit a big play or two and put some pressure on the Rider offense to make plays, the game could certainly come down to the final minutes. The Colts will seek their 4th playoff win in school history and first since 2005. The Riders make their first trip to the post-season since their regional final run in 2006, and will seek the school's 24th playoff victory. The Riders were one of two division 4 teams to finish the season with 3 losses and a computer point score higher than 20. The only other team was Germantown Valley View, who we played in the 1994 Div 4 state final, which just happens to be documented here and here, if you need it. Buy Presale...or take out a loan. Good Lord....$9 at the gate? Yikes. Guess I'm getting tickets presale. All the usual haunts have them for sale..Seifried's, the OHS athletic office and Carmichael Sports. Wonder if you can get a Triway ticket at Carmichael's also? Presale tickets are only $7 and the school gets a cut of only the presale ticket sales. Don't worry though...if Orrville makes it to the state semifinals, the price goes up to $8 presale and $10 at the gate. A good problem to have I guess. Hope we're good enough to make it, and if we do, I doubt you'll see people complaining about ticket price. I think the Riders being at home on a dry field will help them. If we can score 32 against the Colts on a muddy field, I can't see us getting stopped on a dry field. I do think Clear Fork plays inspired and may even take a lead into halftime....but the Riders talent is just too much in the end. Rider advance with a 28-14 win. Fantastic50.net says Orrville by 4 pts. I'm guessing The Daily Record picks Orrville 7-2. Any online radio coverage that you're aware of? Thanks!! Show your guts. Tradition is what Devault needs to speak of in the locker room. We had names like, Reusser, Stultz, Denson, Zwick, Bolyard etc. CLearfork doesnt. We have 20 playoff appearances, Clearfork doesnt, RTR coach. Red Rider Tradition. Everytime you put on that jersey, it means something to a town of 9000. Tradition, tradition, tradition!!!!!! Game will be on WQKT. Don't know about any coverage by a station in Mansfield...checked yesterday but didn't find any listings. WQKT.com will be webcasting the game as well. I'll update the post to reflect that. Thanks.